Steven Goddard over at his RealScience blog recently dug up a news clipping from 1983. That’s 27 years ago – and a full five years prior to the establishment of the Intergovernmental Panel on Climate Change (IPCC). These days we’re advised that the reason we should believe climate change is a serious problem is because IPCC reports say so. We’re told that, after careful examination of the evidence, in 2007 thousands of the world’s smartest scientists concluded that recent warming (during the last third of the past 150 years) is very likely the result of human activities. 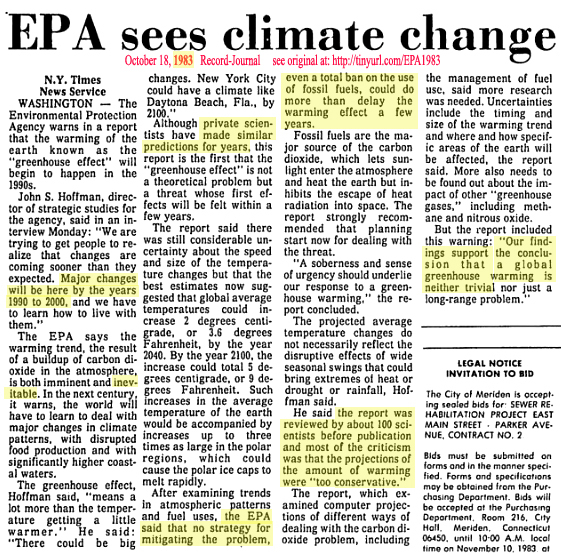 However this article – distributed by the reputable New York Times news service – demonstrates that the US Environmental Protection Agency (EPA) had already made up its mind a quarter-century before that. Back in 1983 newspaper readers were advised that global warming wasn’t a trivial matter, that “major changes” were inevitable, and that some of these changes would be evident as early as 1990. This jibes with a remark meteorologist Richard Somerville made to a committee of the US Congress last week [41-page PDF here]. Even though the IPCC – which Somerville has participated in – only announced its finding in 2007, Somerville declared on page 25 of his written testimony: “We scientists have been aware of [the urgent, human-caused global warming problem] for more than 30 years.” As proof, he cites a research paper from 1978. But 30 years prior to the IPCC’s 2007 findings, the evidence that global warming was the fault of humans was surely rather scant. I mean, the IPCC took two decades and conducted four full assessments before arriving at its current milquetoast conclusion. Nevertheless, scientists in the 1970s and 1980s were prepared to frighten the public with dramatic statements. How do we know the scientists of our era are any different? As the head of the United Nations Environmental Programme observed last year, IPCC reports have frequently been criticized (by activists and activist scientists) as being too conservative. Here’s an example from December 2008 that says the IPCC’s sea level rise numbers are too conservative. Here’s another from December 2009.
how can we be sure that that such matters were examined in a genuinely objective manner by the IPCC? how do we know the IPCC wasn’t dominated, from the very start, by people already committed to this point-of-view? what concrete steps did the IPCC take to acknowledge – and guard against – this pre-existing point-of-view? does anyone really believe that a scientist employed by the EPA would reach a conclusion that conflicts with what seems to have been the EPA’s global warming position since 1983? This entry was posted on March 13, 2011 by Donna Laframboise in activist scientists, climate bible, historical perspective, IPCC, predictions that failed and tagged activist scientists, climate bible, EPA, historical perspective, Intergovernmental Panel on Climate Change, IPCC, predictions that failed, Richard Somerville.